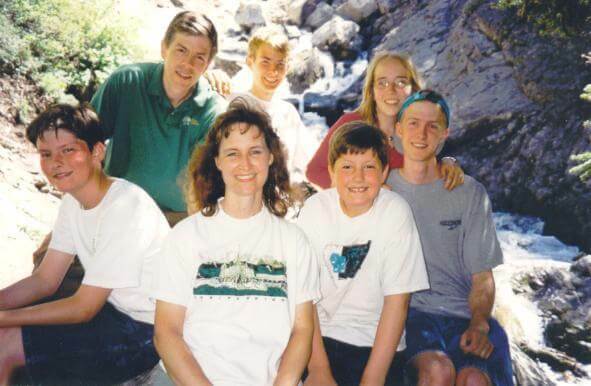 Here we are in Big Cottonwood Canyon, near Salt Lake, where we have hiked up a side canyon toward Donut Falls. In addition to Jeff and Kendra Lindsay, there is Stephen (19), Daniel (15), Ben (12) and Mark (10), and Stephen's fiancée, Meliah Lipp. 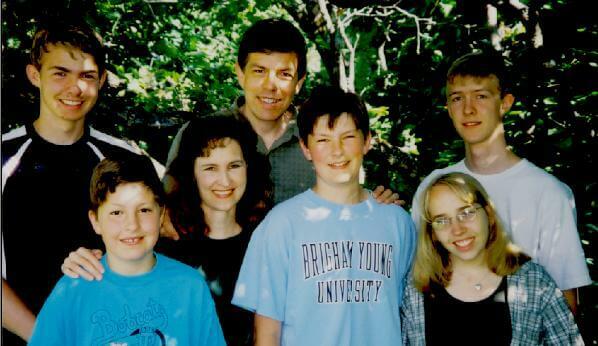 Stephen's blue baseball cap might be confused as blue hair - but no, he's not into BYU sports. 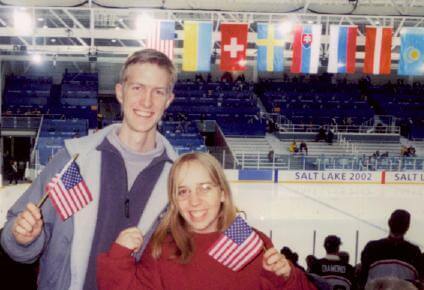 Stephen and his fiancée Meliah had the privilege of attending the Winter Olympics in Salt Lake City in February 2002. Here they are in the ice arena. 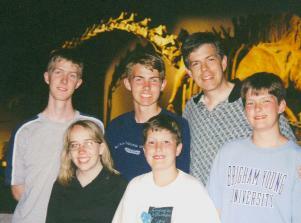 One surprising highlight of the trip was our visit to what may be the nation's best dinosaur museum at Thanksgiving Point between Provo and Salt Lake City (near Lehi, on I-15). An incredible place! Others may laugh, but one of my true highlights of our June trip to Utah was spotting this moose - yes, a live moose - in a pond on the way to Cascade Springs from Provo Canyon. 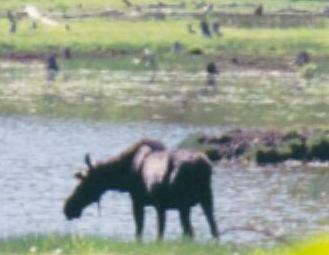 This was my first wild moose. Does life get much better than this? We'll see. 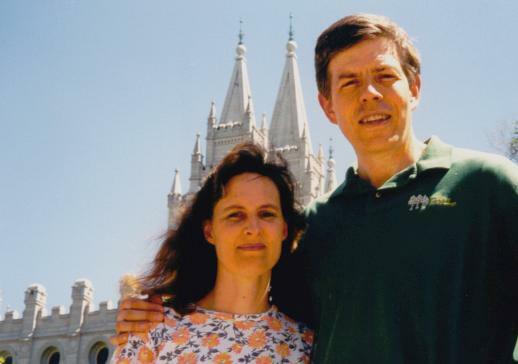 Here we are in the woods of Utah. Yes, there are actually some trees and bushes out there. 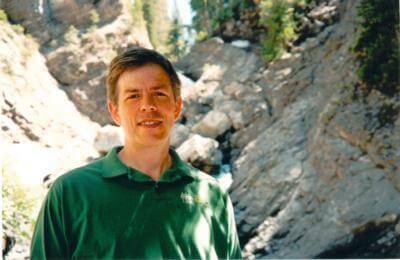 That's me on a hike in Big Cottonwood Canyon (I think that's where I was). 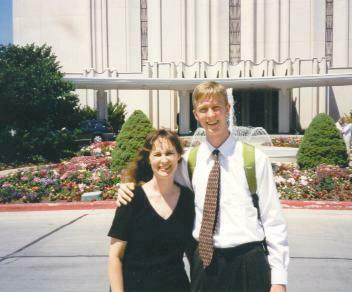 This is Kendra and Stephen in front of the Jordan River Temple, just south of Salt Lake City, on June 18, 2002, just after Stephen received his Endowment in the Temple as part of his preparations for serving on a two-year mission in Argentina. 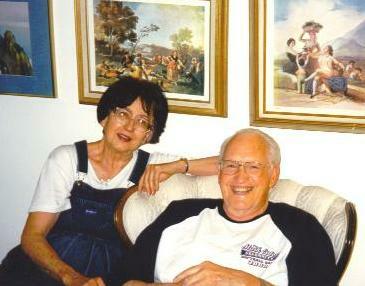 A view of my parents, W. Dean and Mary Lindsay, in their home in Salt Lake City, while we visited them in June 2002. Toward the end of our June trip to Utah, we visited the State Capital Building. 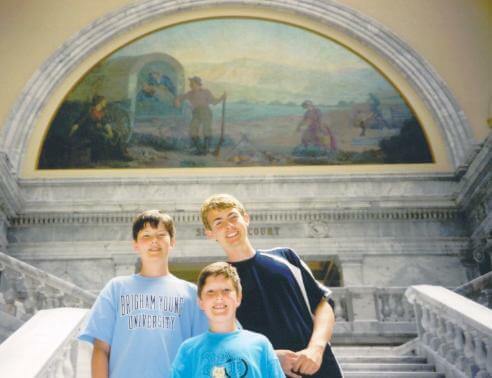 Here three of my boys, Daniel (15), Ben (12), and Mark (10) pose in front of a pioneer mural above a stairway. At the airport on June 19, before seeing Stephen for our last time in two years. Buena suerte en Argentina, mi hijo! 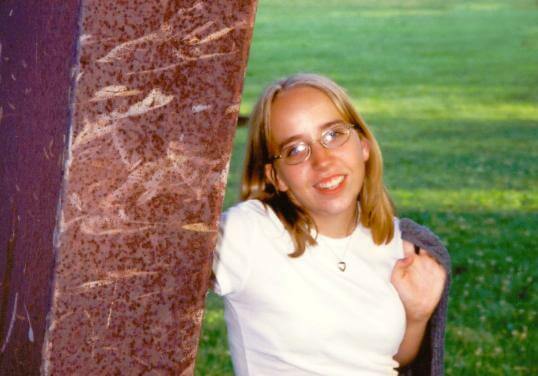 Our daughter-in-law-to-be, Meliah Lipp of Kaukauna, very close to Appleton, pictured here by a modern sculpture (i.e., big chunk of rusting metal) in Telulah Park. While our son Stephen is making a great sacrifice to leave his beautiful fiancée for two years, the Lindsay family back in Appleton is enjoying the addition of a long-missed daughter. Meliah has really become like a daughter to us and a sister to the younger boys. 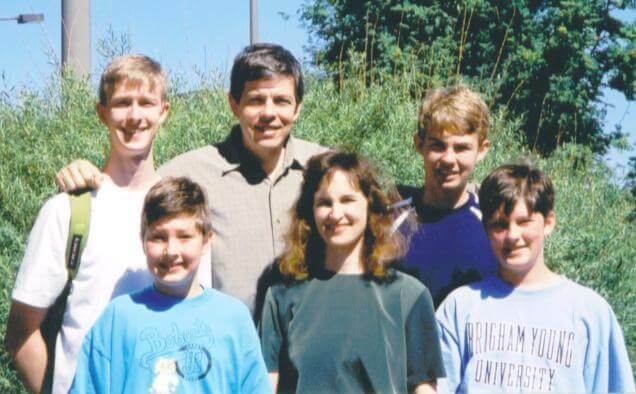 When Stephen returns, they'll get married in a flash and move back to college. Then we'll essentially be missing two of our kids, not just one! 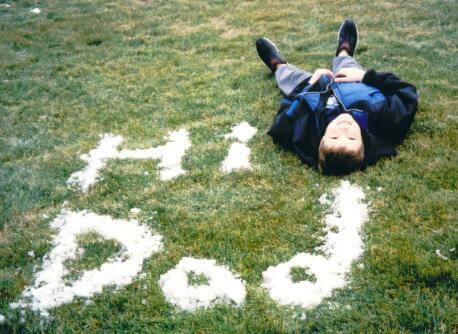 In the spring of 2002, when there were still a few piles of snow left, my son Mark arranged the snow on our lawn to greet me with this message when I returned home from work.